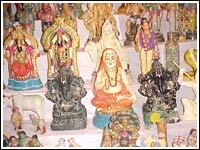 Navratri or Navratra is a Hindu festival of worship and dance. The word "Navratri" literally means nine nights; Nav-Nine and Ratri-nights. The festival is celebrated for nine nights every year at the beginning of October although as the dates of the festival are according to the Hindu calendar (which is based on the Moon), the festival may be held for a day more or a day less depending on the calendar. On the tenth day, an effigy of Ravana is burnt to celebrate the victory of good (Rama) over evil.